Charlie Prendergast has been in great form since the start of the season just over one month ago. And now he has claimed victory in the Waller Cup in Bohermeen from Marc Potts. Charlie Prendergast has taken his third victory of the season at the Waller Cup in Bohermeen, Co Meath. The Castlebar Cycling Club man saw off Irish track international rider Marc Potts (Unattached) with the emerging Conor Murnane of UCD Cycling Club in 3rd. The seeds of Prendergast’s victory were sown on the second lap of eight on the Co Meath circuit. There had been a split in the field at that point and from that five riders would go clear. The eventual top three – Prendergast, Potts and Murnane – were in that group. Also present were Darnell Moore of Caldwell Cycles and Ciaran Handley of McNally Swords Cycling Club. That five worked well together over the follow laps but on the final circuit the battle was on up front. Prendergast managed to get clear, with Potts going with him. And at the finish it was the Mayo man who got the verdict. Thanks to his strong start to the season, Prendergast was top of the Cycling Ireland A1 rankings before this weekend’s racing got underway. He opened his campaign with 2nd at the Mick Lally Memorial and 2nd at Rás Naomh Finian. 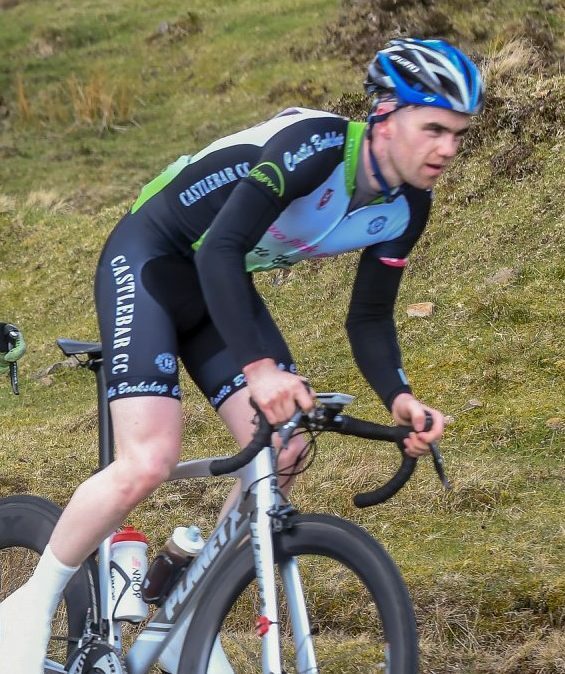 Following that he placed 3rd in the Markievicz Cup and claimed Rás Mhaigheo overall after winning the opening stage and finishing 2nd on the final stage.